Michael Waltrip Racing is at a crossroads — What’s next? 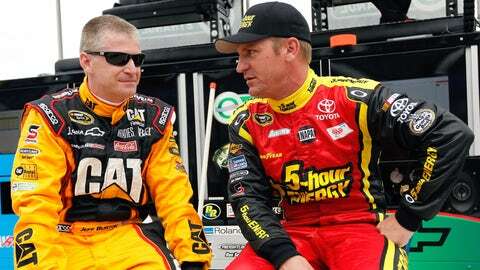 Former teammates Jeff Burton (left) and Clint Bowyer (right) will be teammates once again next season. One of the organizations going through a transition for 2014 is Michael Waltrip Racing. They are going from three fulltime cars in 2013 to two fulltime cars, plus a third part-time car in 2014. Mark Martin and Martin Truex Jr. are gone and Jeff Burton has now been added to the lineup. I think it is a good addition for them. Not only will they benefit from Jeff’s experience, but he and Clint Bowyer will once again be teammates like they were at one time at Richard Childress Racing several years ago. They already have chemistry and an understanding of one another. I see it as a plus for Clint, bringing someone new in that he has already worked with. For the other teammate, Brian Vickers, I think Jeff’s experience will help move Brian’s team along more rapidly. So landing Jeff Burton is one of the luckier breaks of the year where Michael Waltrip Racing is concerned. There is no denying that the team had a devastating finish to 2013 with the loss of NAPA as a fulltime sponsor, and Martin Truex Jr. as their driver. What they went through could have sent them into a complete tailspin and been a major setback to the organization. When you bring a veteran with the credentials that Jeff Burton has who understands the importance of structure and communication within an organization, it is a great move to help calm the waters, you might say, around Michael Waltrip Racing. Brian winning the race earlier this year plus moving back to fulltime status is huge. You, however, can’t dismiss the fragmentation that comes with the loss of crew chief Rodney Childers, who has moved over to Stewart-Haas Racing in 2014. There are still a lot of experienced key people at Michael Waltrip Racing, but they are really going to have to step up in 2014 like never before. I simply can’t overemphasize how traumatic the incident at Richmond in September was to the entire Michael Waltrip Racing organization. I know and expect it to take some time for it to fully wear off and for them to come out on the other side. I just think though that if you understand the task at hand and are here for the long run, we’re going to really find out what Michael Waltrip Racing is made out of. Everyone over there, from the owners all the way down to the guys who sweep the floors, is going to have to step up in 2014 in a totally different light. Losing NAPA was a harsh blow to their future but if you go ask Rick Hendrick, Jack Roush or Richard Childress, they will tell you that in today’s sport, you need three competitive teams under your banner. So that’s going to be the goal of Michael Waltrip Racing to get back to having three fulltime and competitive teams. The year 2014 is going to be a challenging one for them. There is simply no denying that or denying they are at a crossroads. Will they be able to rebound, learn from their mistakes and move forward, or will we see the erosion or unraveling of what once looked to be a very promising organization?